There is always that sense of ravenous desperation in the spring that sends us on long hunts for the first asparagus, nettles, rhubarb, salad greens, or radishes of the season, the hope against hope that there will be something crisp and juicy and fresh and alive at the farmers market despite my still being wrapped in down and wool. This year that hunger was particularly sharp. With PATH out of commission from October into January, Hurricane Sandy stranded me on a small island on the far side of the Hudson from the trucked-in variety to be found in Manhattan markets; our own supermarket was flooded with damage that took 15 weeks to repair. Our little greengrocers re-opened sooner but have very edited produce departments. And, honestly, there were other more important things than produce to worry about during this past dark winter. But spring has finally arrived and the burgeoning farmers markets and longer days have inspired us. So long story short, a few weeks ago we thought it would be fun to be mostly vegetarian for a while to see how many ways we could cram vegetables into our diet, like a tonic to our systems. I appreciate the luxury to have so many things available to cook and I’ve been enjoying the challenge to my creativity. Instead of trying to replicate the meat-and-three-sides meal, I’m looking to more vegetarian (or at least less meat-centric) food cultures for inspiration with vegetable curry, my sriracha soba noodle salad, my beloved pizza with “salad” on top, or black bean and corn chiles rellenos. I’ve been using a variety of whole grains, enjoying their uniqueness when they are the feature rather than the side dish. Millet is a staple food in parts of Africa and India but is most commonly seen in bags of bird seed in North America. 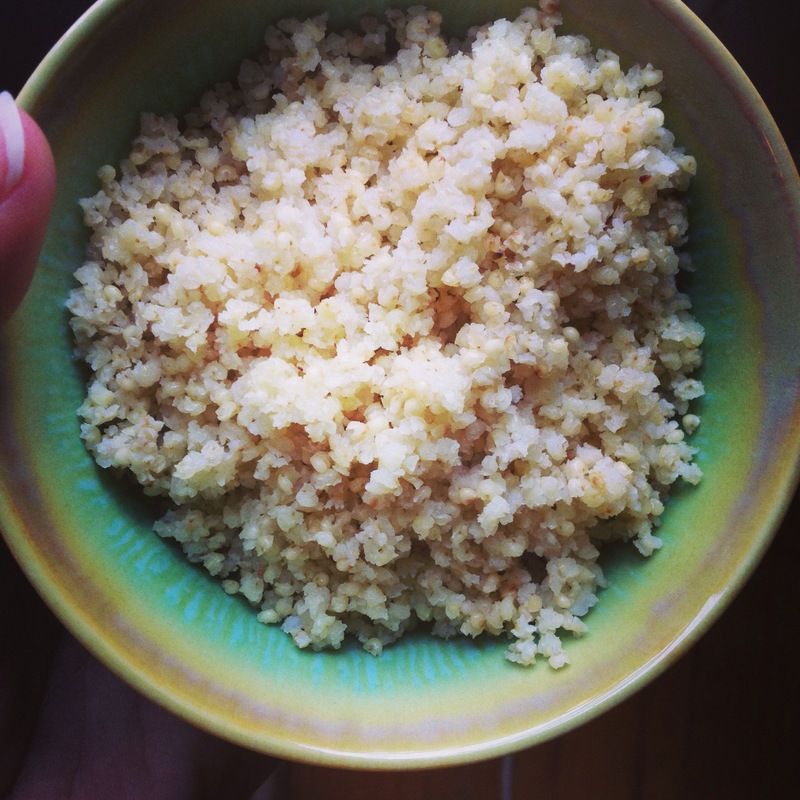 It is a tiny grain, about the size of a seed bead, and cooks to a similar texture as couscous at the 1:2 grain to water proportion but with a cornier, nuttier flavor (which the toasting or frying I describe in the millet technique section enhances). I’ve used it in a multigrain bread where it adds a little texture to the loaf. 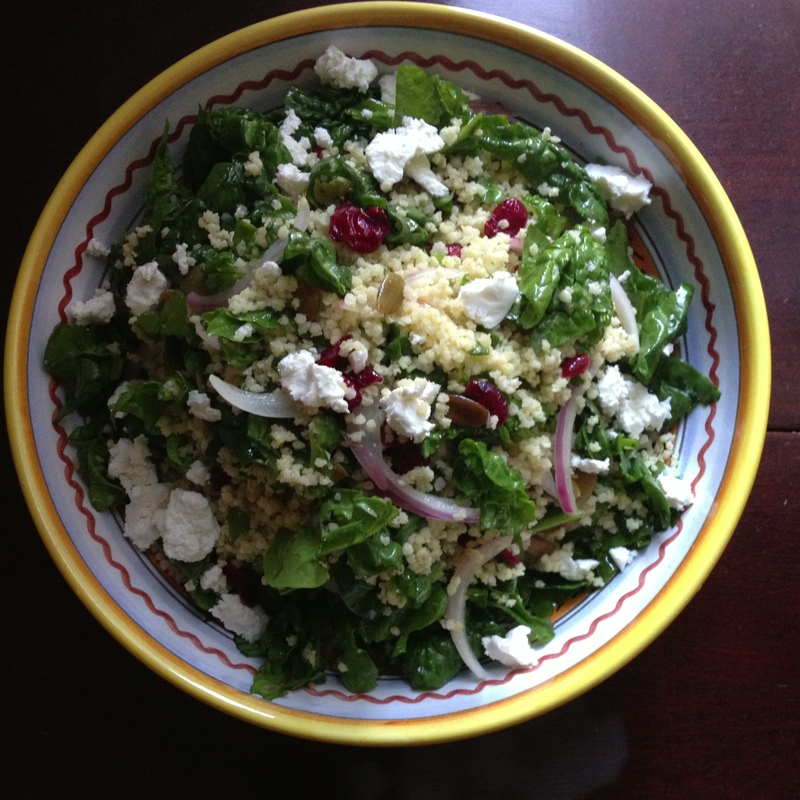 I wanted to cover all the bases of texture and flavor in this salad: crunchy toasted pepitas and creamy fresh goat cheese, tangy sweet cranberries and earthy spinach and crisp savory red onion to tie it all together. We ate this with an avocado salad last night. Pour a tablespoon or so of olive oil into a heavy bottomed sauce pan, stir in the millet over medium heat. Toast the millet, stirring frequently, until it smells lightly nutty. Raise the heat to med/high and pour water over the millet. Stir to break up any clumps, add a couple pinches of salt and bring to a boil. When the water boils, reduce the heat to low, cover with a tight-fitting lid and simmer for 20 minutes until the water is absorbed. Turn off the heat and leave the millet covered for another 20-30 minutes until it is cool enough to handle. The millet will be fluffy and all the water should be absorbed. In a large skillet or sauté pan, heat 2-3 tablespoons of olive oil and stir the pumpkin seeds into the oil over medium heat. Stir constantly until the pumpkins seeds are golden brown and toasted. Turn off the heat and stir the sliced onion in, it should wilt slightly in the residual heat of the pan, infusing the oil with flavor. Pour the millet into the sauté pan. It will probably be in large clumps like couscous; gently break it up into individual grains with your fingers. Drizzle the wine vinegar over the millet. Toss in the spinach and cranberries and mix into the millet. Salt and pepper to taste. Dollop chunks of fresh goat cheese over the top and serve at room temperature.